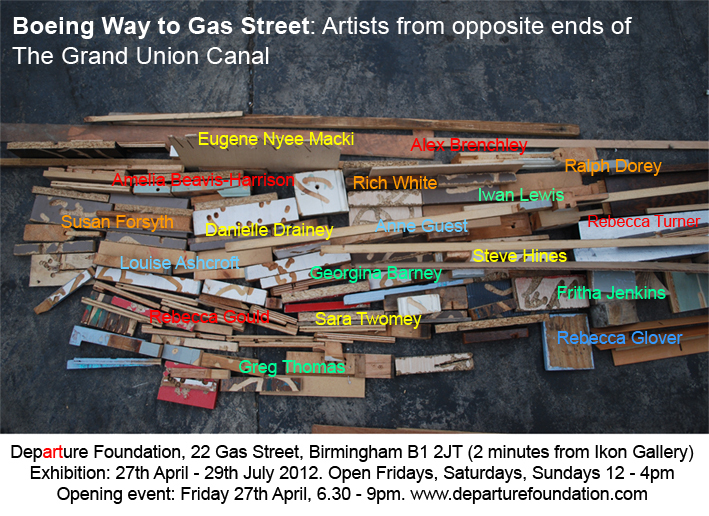 Artists from opposite ends of the Grand Union Canal. It is a group show of work by artists from our Southall studios, London, and work by artists from in and around Birmingham. The Grand Union Canal runs alongside the Southall studios at Boeing Way and continues all the way to Gas Street Basin beside the exhibition space. By using the passage of the canal as a curatorial device, the show brings diverse works together to reflect on the relationship between these two major industrial cities in our post-industrial age. If you can make it – do! I will blog again when my work is up. 12 Apr	This entry was published on 12/04/2012 at 8:42 PM. It’s filed under Uncategorized and tagged architecture, art, Birmingham, Departure Foundation, exhibition, industrial, language, London, sculpture, Southall Studios, text. Bookmark the permalink. Follow any comments here with the RSS feed for this post.